Distance (inches or feet) travelled by the harvester during data logging time period. Width (inches or feet) harvested during each logging time period. Silage or grain flow (mass) measured by the equipment’s flow sensor per logging time period (lbs/second). Moisture content (MC in %) of the harvested mass as measured by a moisture sensor per time period. Logging interval of the yield monitoring system (seconds). Errors that impact the accuracy of the yield data occur in multiple ways. The distance the combine/chopper travels during a time period and the width give the area required for yield calculation. If a combine is not equipped with a harvest swath width sensor, the default will be the chopper/combine width and that can cause errors when fewer rows are harvested than the equipment width. Another source of error is the delay time of grain or silage moving from the chopper/combine head to the flow rate sensor. Flow rate sensors, moisture sensors, and Global Positioning System (GPS) units are located in different places on harvest equipment and since it takes some time for harvested silage or grain to travel to the sensors, adjustments need to be made (this is called delay time correction). Each harvest pass will be affected by this delay correction, independent of whether a new pass starts from one end of the field or from somewhere within the field (in situations where the harvester is paused during harvest). The delay time itself is related to the speed of the combine/chopper as well, which may introduce another source of error. Combines and forage choppers are calibrated for a certain velocity range. If the velocities that are recorded fall outside the calibrated range, flow rate and yield values associated with those points are no longer trustworthy and should be removed from the data. Similarly, abrupt changes in velocity affect the flow rate, resulting in erroneous yield calculations for logged data points. Other easily trackable errors are logged data points with zero grain or silage moisture; this may occur as the chopper or combine enters the field or pauses mid-field while the silage or grain flow has not yet reached the moisture sensor. Last but not least, if the operator does not raise the combine/chopper head after completion of a pass, the pass number will not be updated in the logged dataset. Cleaning of data that are obtained this way will take additional effort, so lifting of the combine/chopper head while turning in the field is recommended. 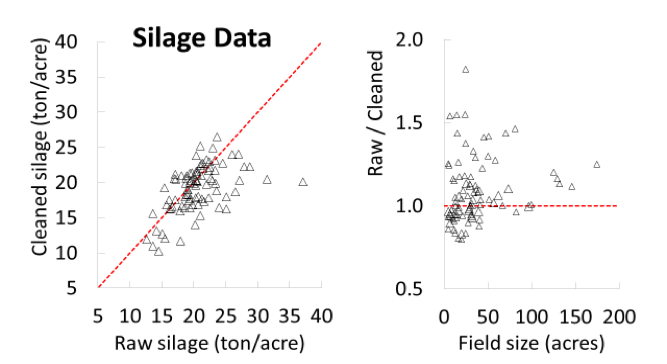 The use of raw data without proper cleaning can lead to substantial over- and under-prediction of actual yield depending on the field and harvest conditions, especially for corn silage yield data. Figure 1 shows this in more detail for a number of fields. Look at a 20 ton/acre corn silage yield (cleaned yield) for the fields in this figure, and you will see that the raw data corresponding to this cleaned yield can range from 15 to 37 tons/acre! The raw data for many of the fields in this figure overpredicted yield, while for a number of other fields it actually underpredicted. Thus, data cleaning is absolutely necessary. Figure 1: Not cleaning yield monitor data can result in large over or under predictions of actual corn silage yield. 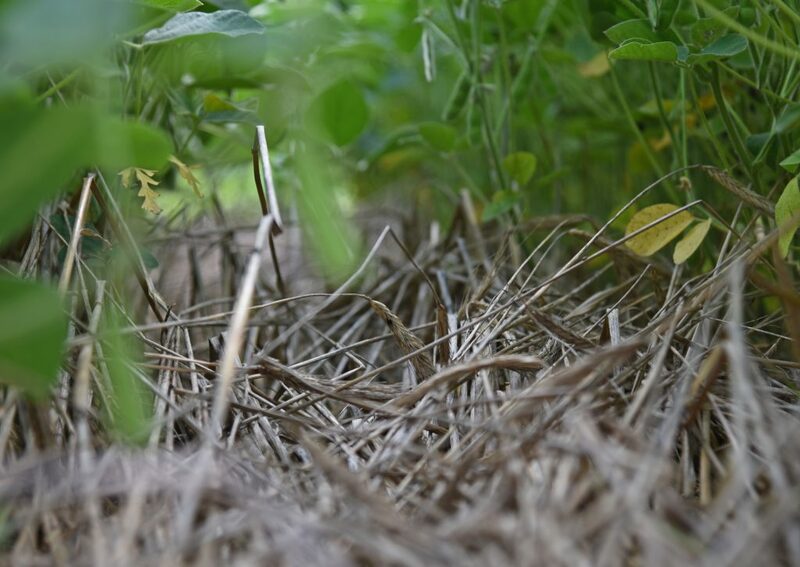 In the past months, the Cornell Nutrient Management Spear Program, in collaboration with colleagues at the University of Missouri, the United States Department of Agriculture Agricultural Research Service (USDA-ARS) Cropping Systems and Water Quality Unit, Columbia MO, and the Iowa Soybean Association, evaluated cleaning protocols to develop a standardized and semi-automated procedure that allows for cleaning of datasets for whole farm yield data recording. The protocol developed for whole-farm data cleaning calls for unfiltered or “raw” harvest data files that are downloaded from the yield monitor with corresponding field boundary files. These files are read into the Ag Leader Technology Spatial Management System (SMS) software to preview the yield map and reassign any harvest data that might show up in the wrong field. Next, the individual field harvest data are exported as Ag Leader Advanced file format. The yield map files are then imported into Yield Editor (https://www.ars.usda.gov/research/software/download/?softwareid=370) for cleaning. Yield Editor is a freely available software developed by the USDA-ARS. The software allows for use of different ‘filters’ to remove the errors mentioned above. The final step in the cleaning protocol is deletion of data points with a moisture content <1 % for corn grain and <46 % for corn silage, which can be done in Yield Editor or in MS Excel or other sortable spreadsheet program. This final step is particularly important for obtaining accurate corn silage yield data. A step-by-step protocol for cleaning individual field datasets and batch processing of harvest data from growers with large numbers of corn silage or grain fields is described in a manual that is available for downloading from the YieldDatabase page (http://nmsp.cals.cornell.edu/NYOnFarmResearchPartnership/YieldDatabase.html) of the Cornell Nutrient Management Spear Program website. Farmers with an interest in sharing corn silage and/or grain yield data with the Nutrient Management Spear Program for updating of the Cornell University yield potential database are invited to get in touch with us. The protocols for data sharing are available at the same weblink listed above. If interested in training sessions on the cleaning protocol this winter, contact Quirine M. Ketterings at qmk2@cornell.edu. We thank the farmers and farm consultants that supplied data for this project, and our NMSP team members and colleagues in Missouri and Iowa for working with us on the protocol. For questions about the project contact Quirine M. Ketterings at 607-255-3061 or qmk2@cornell.edu, and/or visit the Cornell Nutrient Management Spear Program website at: http://nmsp.cals.cornell.edu/.